The Langley Knights have been eviscerating opposing defences this season. Wins such as Thursdayâ€™s, in which the Knights outscored the visiting Delta Ice Hawks 9-6, are beginning to become commonplace at the George Preston Recreation Centre. The Knights have now scored a staggering 40 goals in their five home games this season, an average of eight per contest. Their most recent victory gives the Knights a 6-3 record, tops in the Pacific Junior Hockey Leagueâ€™s Harold Brittain Conference. Langley is riding a three-game win streak and is undefeated on home ice. With 55 goals in nine games, one more than the Tom Shaw Conference-leading Richmond Sockeyes, the Knights are the highest scoring team in the PJHL. Langley forward Carson Rose had a monster game against the Ice Hawks, scoring five of his teamâ€™s nine goals. Colin Catchpole tallied twice for the Knights, with Darien Craighead (who also had three assists) and Jacob Fricks rounding out the Langley goal-scorers. Oliver Alcock had three assists for the Knights, who led 6-5 after two periods before outscoring the Ice Hawks 3-1 during the final frame. The Knights worked overtime on Wednesday to edge the Kodiaks in the first ever meeting between the new junior B hockey cross-town rivals. Levi De Waalâ€™s power play goal 47 seconds into the first overtime period lifted the Knights to a 5-4 win at Aldergrove Arena. â€œIt could have gone either way,â€ Kodiaks associate coach and general manager Rick Harkins said. A tripping call on Aldergrove defenceman Wyatt Versluis with 1:06 to go in regulation proved to be the difference, as his penalty time spilled into the extra session. The winning marker capped a four-goal night for the 20-year-old De Waal, an Aldergrove native who is off to a scintillating start to his final season of junior B hockey. â€œHeâ€™s a kid who has stayed the course for four years, now, and is getting rewarded for all of his hard work,â€ Knights head coach John Craighead said. The Knightsâ€™ Tristan Craighead opened the scoring&nbsp; 5:36 into the first period. The visitors looked as though they were going to take a 3-1 lead into the first intermission courtesy of a pair of goals from De Waal, however Aldergroveâ€™s Aaron Markin scored with a second to go in the opening frame to narrow the home teamâ€™s deficit to 3-2. The Kodiaks rallied during the second period, outshooting the Knights 18-7 while scoring an even strength goal from Quinncy Leroux and a power play marker off the stick of Jordan Funk with 3:09 remaining in the middle frame to take a 4-3 lead into the second intermission. De Waal tied the game at 4-4 when he scored 3:30 into the third period. The rest of the game was scoreless, setting up the overtime period. Dryden Wust had the other goal for the Kodiaks, who outshot the Knights 34-25 through three periods and overtime. Craighead was happy with his teamâ€™s play, not just on Wednesday but overall, as well. That said, Craighead gave the Kodiaks a lot of credit. The defending PJHL champions have 16 rookies, including both of their goaltenders, on their roster and heading into their game versus Ridge Meadows on Friday, have a respectable 3-3-1-2 record. For his part, Harkins is loving the Aldergrove/Langley rivalry. ICE CHIPS: Special teams have made a difference for the Knights. 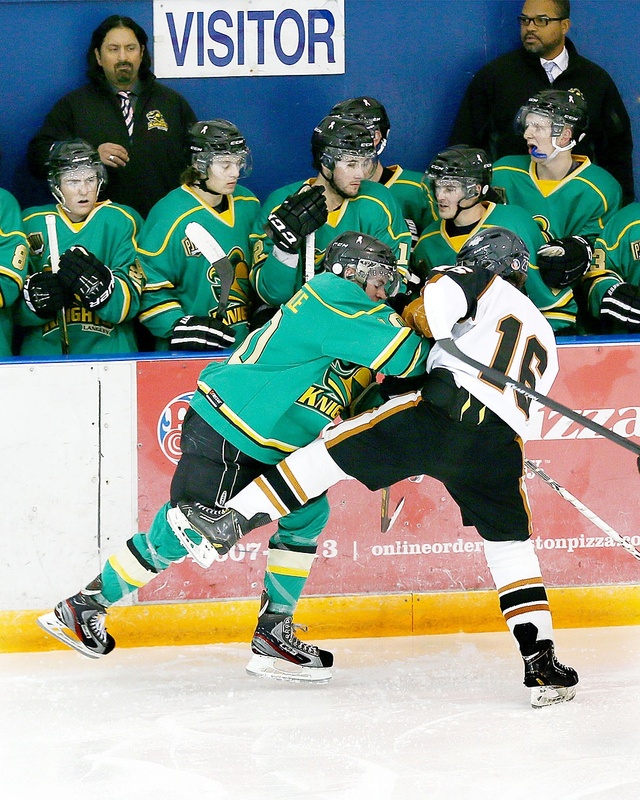 They have the top-ranked powerplay amongst the 10 PJHL teams, scoring a 31.37 per cent clip.